WASHINGTON -- Rejected dealerships pursuing arbitration under new legislation will pay at least $12,000 in fees and as much as $100,000, depending on the complexity of their case, dealer attorneys said. Among the expenses to be incurred by stores seeking reinstatement are fees for filing and for other administrative moves, as well as for arbitrators, lawyers and expert witnesses, attorney Mike Charapp of McLean, Va., said in a report for Washington-area dealer groups. These payments would be spread out over the six-and-a-half month arbitration process which would be triggered by President Barack Obama's expected signing of the legislation, the attorney said. Not included in this estimate are any payments received from General Motors Co. and Chrysler Group and returned to the automaker, as required by the legislation, should a dealership be successful in arbitration. 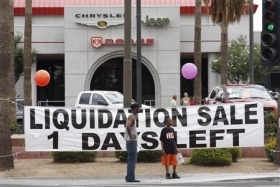 Some stores that win their cases might have to return as much as tens of thousands of dollars, since GM has extended about 25 percent of the wind-down payments to its dealerships slated for closure by October 2010, said Chris DeVito, a Cleveland attorney. The legislation gives as many as 2,150 rejected GM and Chrysler dealerships access to neutral arbitration under the American Arbitration Association. The measure, which was part of a $446 billion spending bill, passed the Senate on Sunday after clearing the House last week. Charapp, who has represented dealerships in arbitration disputes with suppliers and customers, said in an interview that costs would vary widely depending on what automakers tell stores are the reasons for their termination. From the date that Obama signs the legislation, GM and Chrysler have up to 30 days to tell dealerships the criteria used in marking them for closure. Costs can also vary depending on how complex a case the dealership intends to make, how organized its files are, and whether it keeps lawyers on retainer, Charapp said. • Filing and other administrative fees under arbitration association rules are likely to cost between $2,000 and $3,000, he said. • Arbitrators typically charge about $400 an hour and would need at least 20 to 25 hours to read, hear and judge the case, as well as to write a decision, he said. That's another $10,000 or so. • Total arbitration costs of $12,000. But under the legislation, dealerships and automakers are required to split the costs of arbitration, leaving dealerships with an expense of $6,000. • On top of that, most dealerships will end up hiring lawyers and paying them an hourly fee of between $300 and $600 an hour, Charapp said. At a minimum, these lawyers will work the same 20-to-25-hour stints as the arbitrators, he said. • Legal fees: $6,000. Add that to the $6,000 for arbitration, and you get a minimum $12,000 cost for dealerships, Charapp said. Many cases will be more complex because they involve issues of dealership performance and economic viability, he said. For these cases, dealerships might want to hire an expert witness, typically an economist or accountant. Their fees: also between $300 and $600 an hour, he said. These more complex cases also ring up many more billable hours for arbitrators, lawyers and expert witnesses, Charapp said. Some dealerships also may need to pay extra expenses to pull together documents, reports and analyses in support of their case. Tallying up the various fees for the more complex cases could bring a dealership's cost to more than $100,000, he said. DeVito, who reviewed Charapp's breakdown of cost estimates, said he concurred with each as well as with the overall range estimated.